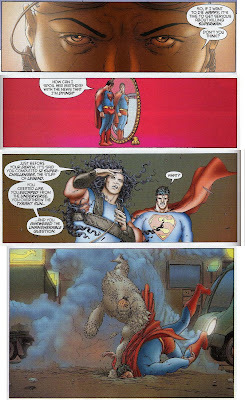 I just wanted to welcome everyone coming to my blog from Comics Should Be Good and Journalista, and say thanks to Brian Cronin and Dirk Deppey for thoughtfully linking to my All Star Superman in Eleven Panels post. I also want everyone to know that since that post was such a success (and was a fun thing to do), I've decided to do a whole series of "Superhero Minimalism" posts where I try to summarize comic book series using only single panels from each issue. So make sure to come back and check that out -- the next post in the series will be up early next week. Any guesses as to what I'll do next? 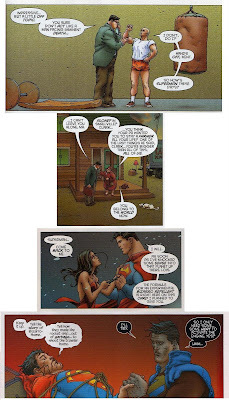 One of the great aspects of All Star Superman is its economic use of pages to tell an epic story. 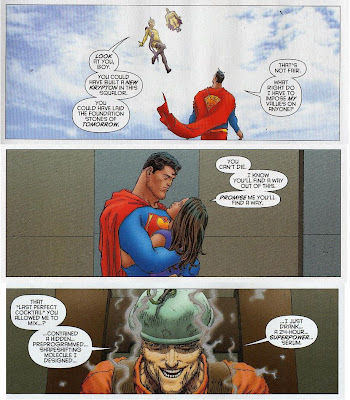 Writer Grant Morrison and artist Frank Quitely effectively communicate entire scenes in single panels. You could call it superhero minimalism. In that spirit, I thought it might be neat to try to retell the story so far, using only one panel from each of the first eleven issues, in an attempt to put together a (somewhat) coherent summation of the book/trailer for the twelfth and final issue. Let me know what you think: did it work? Do you have suggestions for different panels to use? Remember, only one panel per issue. Also, if anybody knows how to set this up as a slideshow, let me know. Now that the series has concluded with issue twelve, I've gone ahead and put up a post with the final panel. I still can remember playing the original Prince of Persia video game. It was a fairly straightforward side-scrolling action-adventure, but it stood out from the pack for two reasons: first, the movement of the characters was so fluid -- it felt like you were moving an acrobat around the screen; and second, the ancient Persian setting was unique and enchanting. The more recent Prince of Persia: The Sands of Time game managed a similar achievement, albeit with better graphics and a third dimension. Both versions were downright fun. Now the game's creator, Jordan Mechner, has produced a Prince of Persia graphic novel to coincide with the upcoming movie version and relaunch of the video game. And behold: the comic book succeeds for the same reasons that the video games did, which is no small feat. The book is not a simple action-adventure, however, but instead tells two intertwining stories of love, death, betrayal, and fate, both set in the fictional land of Marv. One story takes place during the ninth century A.D., and follows the exploits of Prince Guiv, who leaves his sister and brother as Marv's rulers after he has a vision of the future. 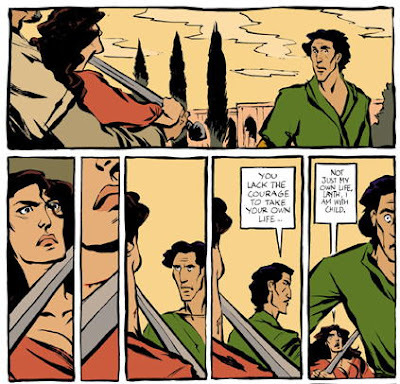 The other story takes place during the thirteenth century, and concerns itself with Shirin, the daughter of Marv's ruler, who sneaks out of the city and meets a young man who tends to the city's water system. The two storylines are connected by a mysterious prophecy involving rebellion. Mechner and his co-writer, A.B. Sina, seem more concerned with creating an epic legend than with swash-buckling, and that is refreshing. They do a tremendous job building this small world and evoking the flavors of ancient Persia. And that is not to say that the book is dull or slow-moving. On the contrary, the action seamlessly flows back and forth between the tales, and the pacing is breathless. I recommend this book. The story is engaging, the characters intriguing, and the art first-rate. 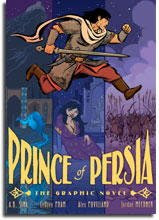 Prince of Persia is 190 pages, with additional backmatter. It is published by First Second and will be available on September 2, 2008. You can read an excerpt here, watch a trailer here, and order the book here. By the way, Jordan Mechner's first game was Karateka, which I played on the computer at my elementary school -- it was SWEET! 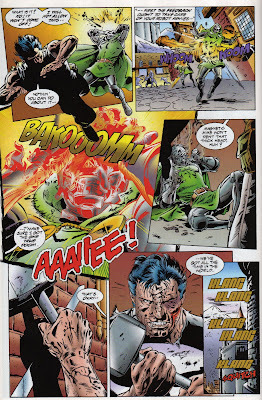 This reprinted one-shot, written by Garth Ennis (Preacher, Punisher MAX) and penciled by Dougie Braithwaite (Punisher MAX, Universe X), tells the story of an alternate reality where Frank Castle's family dies as collateral damage from a battle between super-heroes and super-villains, prompting Frank to begin a quest to slaughter every super-human on the planet (in the "real" world, Castle's family was killed during a Mafia shootout, leading to him declaring his one-man war on crime). It is notable for being Garth Ennis's first time writing the Punisher; since this he has written over a hundred issues and churned out one of the best comics book runs of this or any other era. And even here we can see that Ennis understands the inner workings of the character. His Frank seethes with anger, but at the same time is cold and calculating. It takes the Punisher years to accomplish his task, and he goes about it not by overpowering other super-humans, but by outwitting them. The Punisher doesn't have any innate super-powers; he's just smarter than everybody else and a crack shot. Among other things, what helps to push Ennis's work on the Punisher over the top is the black humor. These super-humans never knew what hit them. There's a great bit where Spider-Man and Venom are duking it out in the sewers, with Peter Parker letting loose with some classic snappy super-hero banter: "Nowhere left to run, Venom!" and "This ends here, Brock! Gimme your best!" It's one of those typical comic book battles that we've seen thousands of times before where there are no real consequences, but here, Frank breaks in on their fight and promptly kills them. Don't expect spiffy chit-chat from the Punisher. Dougie Braithwaite's art is solid if unspectacular. It does the job, but is nowhere near as good as his later work on The Punisher MAX. One problem might have been that there are six different inkers credited on this book. But he communicates the story well, and does a good job rendering many of the heroes and villains of the Marvel Universe. As a side note, it is particularly interesting to read this in light of the recent Civil War mega-crossover, which was touched off by an incident where a super-human brawl kills some innocent bystanders. In that story, the government reacted by passing a new law, that required super-humans to register with the government and go through proper training, etc. The big issue was whether super-heroes should go along with the new law or fight it; it was kind of a debate between choosing liberty or security. Here, we see how the Punisher would deal with that situation: He would kill. Every. Last. One. Of. Them. 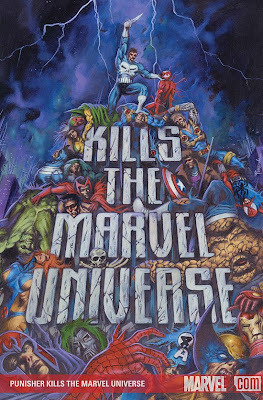 Punisher Kills the Marvel Universe originally was published in 1995. Marvel apparently is dusting it off again before including it in the upcoming Punisher by Garth Ennis Omnibus. It is forty-six pages and costs $4.99. 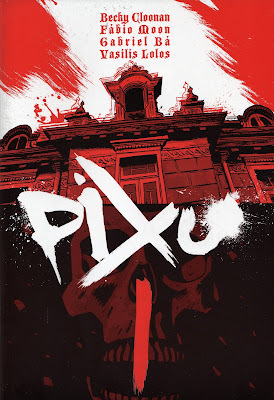 Pixu #1 (of 2) is a self-published, fifty page, black-and-white comic collaboration between Becky Cloonan, Fabio Moon, Gabriel Ba, and Vasilis Lolos. Cloonan's previous work includes drawing American Virgin and Demo, Moon drew Sugarshock and Casanova, Ba drew Casanova and The Umbrella Academy, and Lolos drew The Pirates of Coney Island and The Last Call. 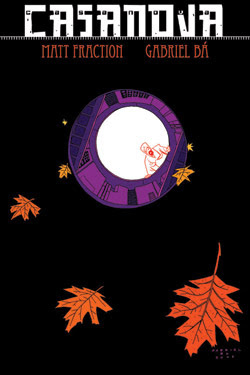 Pixu is the second effort from this group; they recently won the 2008 Eisner award for Best Anthology for their self-published comic 5, which I unfortunately have not been able to locate. 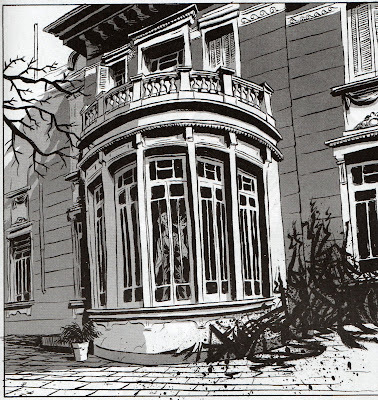 As you may have gathered from its cover, Pixu is a horror comic about people living in a large, creepy boarding house. Each creator is responsible for drawing what happens in one of the four apartments in the house. This arrangement conjured up memories of the mostly-forgotten film Four Rooms, in which Quentin Tarantino, Robert Rodriguez, and, uh, two other guys directed four short films all set in the same hotel on the same evening and involving the same bellhop, played by Tim Roth. Pixu works as a whole much better than Four Rooms did, however, for several reasons. First, instead of four self-contained stories that begin and end before continuing to the next, the comic jumps back and forth between the four apartments. This helps to build the suspense and makes the comic feel more unified. Second, the styles of the four creators don't clash but instead seem like they naturally belong together. Finally, there is an overarching plot -- or at least, an overarching eerie mystery -- that drives all four stories along. We don't learn too much about what is going on in this first issue, other than that things are quickly going from unpleasant to worse. Also, several people appear to be practicing magic. Bad magic. The art is terrific, as you would expect from these four accomplished artists. They do a good job conveying a sense of impending doom and a somewhat stifling atmosphere of evil and unhappiness. 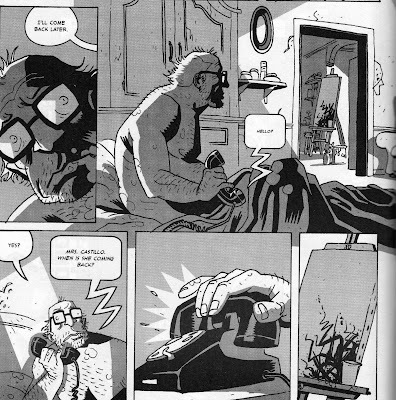 Horror is a difficult thing to pull off in comics, since you really can't control how fast the reader moves from panel to panel and page to page and since things that might look scary, when seen on a movie screen for instance, often just look silly on a printed page. Here, these four artists not only succeeded in creating a genuine sense of terror, but they absolutely knocked it out of the park. 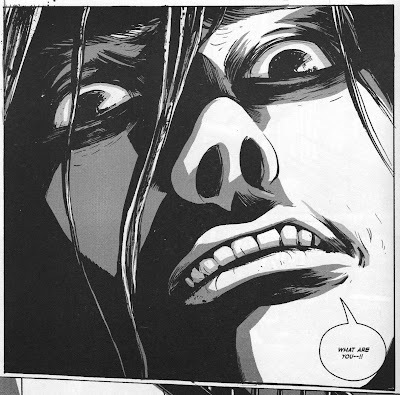 Beyond the somewhat straightforward supernatural horror mystery, I came away with a strong sense that although these black lines of death in the comic book mean actual death to the characters, they also represent a kind of creative death for the comic's artists. They are, after all, unruly, inky, splotchy black lines that are overtaking the panels of the comic, blotting out the clean, simple drawings underneath. Early on, one character states, "They say cleanliness is next to godliness. Let's hope they're right." And cleanliness is one goal in comic book creation, since clean art helps tell your story. That's right, that's an artist's easel with a nice white piece of paper being attacked by the black lines. 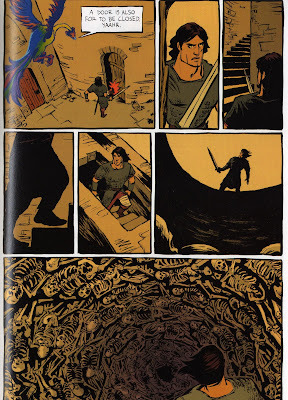 For me, that was a definite signal that Cloonan, Moon, Ba, and Lolos were telling a story that, yes, was about people confronting death, but also about their own fears as artists. We'll see how that plays out in issue two. I highly recommend this book. It was enjoyable, well-crafted, and scary. The creators wrote on the inside back cover, "This comic was made out of our love for comics, our chosen form of art to reflect the themes and pathos of our world." That love for comics shines through in this excellent piece of work. By the way, Pixu #1 had a limited print run of 1000, all copies are signed and numbered, and only are available at khepri.com, so if you are interested in this, order one ASAP. Pixu #2, which concludes the series, is due out in September. I've been thinking critically about the comics that I choose to purchase for the past few days, as I recently closed my subscription account at the local comic book store so that I can purchase comics through on-line mail order sites. I'm always interested in other people's pull lists. Each person's taste is unique, and the reasons people have for buying different comics vary greatly. I also think it is interesting to consider the books that people would like to buy but do not, and the reasons for that. So here is my pull list. One thing to keep in mind is that this list only includes comics that regularly appear on the shelves every month (or so), not things like graphic novels or one-shots. 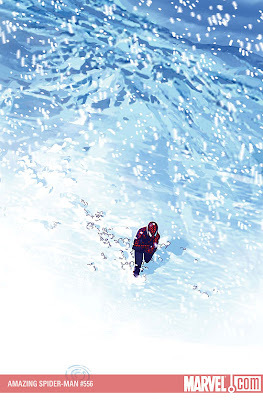 Daredevil: This Ed Brubaker book stars the blind attorney/super-hero in street-level crime stories. I absolutely love this book and think that it lends itself very well to the monthly pamphlet format -- each issue gives you a solid story with a beginning, middle, and end, but ties in with the long story arcs and usually concludes with a good cliff-hanger. The always-on-time nature of the book also helps. All Star Superman: This series ends in one issue, but I have been blown away by Grant Morrison and Frank Quitely's work here. They are at the top of their game: Morrison's ideas are fantastic, Quitely's art is unique and gorgeous, and together they make the Man of Steel both more human and more heroic than any Superman comic I've ever read. I will be sad when this ends. Astonishing X-Men, X-Men Legacy, Uncanny X-Men: I am grouping these books together because the primary reason that I buy them is that -- big surprise here -- I like the X-Men. I grew up as a fan of these characters, and I still think that the core concept is fantastic. The recent Messiah Complex crossover goosed my interest by giving the books an over-arching plot and starting point for future stories. In addition, Marvel usually puts good creators on these books. Currently Warren Ellis writes Astonishing and Ed Brubaker writes Uncanny (although it is probably his weakest book). 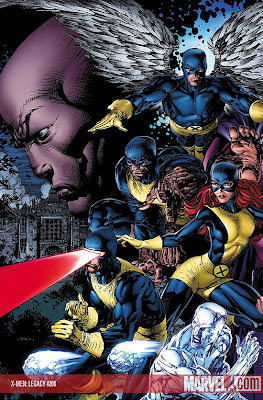 Outside of the big crossovers, I typically don't branch out to the other titles in the X-family, like X-Factor, X-Force, or Wolverine's solo title, because I just don't have the time and money. All Star Batman and Robin the Boy Wonder: I've been buying this because I am a hard-core Frank Miller fan, but I have not been terribly impressed with this series. 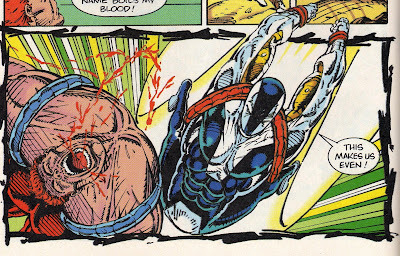 Jim Lee's art, while technically perfect, is just too perfect for the writing. They don't work well together. Outside of the funny/shocking confrontation with Green Lantern in the all-yellow room, it's not doing it for me. But I'll stick with it; it's not like it's putting me out much money, since it only comes out three to four times a year. Astro City: This comic by Kurt Busiek and Brent Anderson is unique on my pull list, since I purchase all the new issues in pamphlet form but am also going back to the beginning of the series and buying the collected trades that I missed. As you'll see below, I don't typically do that -- normally I would just start at the beginning with the trades and ignore the more recent issues until I reached that point. But here, I just couldn't resist. The world that they have created is so much fun to explore, and has such depth, and the characters are so appealing, that I just couldn't stay away. I needed to know what was going on in the city, and I am never disappointed. Like All Star Superman, this comic bursts at the seams with ideas. Casanova, The Order, Immortal Iron Fist, Invincible Iron Man: I've fallen for Matt Fraction. Hard. He writes all of these books (although The Order is now defunct, the second collected volume has not yet been released) and I can't get enough of his work. It's fun, funny, and exciting, with good action, great characterization, and real emotion. I haven't gotten into his Punisher War Journal yet, but that might be because the other Punisher book -- the one that he doesn't write, the one I talk about next -- is probably my current favorite comic. I also have been tracking down all of the one-shots that Fraction has worked on, and I have been very impressed with his work on Thor. The Punisher: I first bought this when issue number 50 came out, and I was so captivated that I have since gone back and purchased all four hardcover collections of the series, and the From First to Last hardcover collection of one-shots, and the Punisher: Born mini-series collection, AND the Punisher Presents: Barracuda mini-series collection. This thing is INCREDIBLE. Writer Garth Ennis has created something unbelievably compelling with his work on the Punisher. Frank Castle has never been so perfectly written, and now that Ennis is leaving the book, that high-water mark will stand for a long time. The stories and images from this book are indelible, unforgettable explorations of darkness. DMZ, Northlanders: I really enjoy Brian Wood's ongoing series DMZ, about the exploits of a photo-journalist in an alternate-world, war-torn New York City. Wood has done a terrific job creating this fictional world that feels so real. DMZ is one of the few comics where the main characters actually develop and learn right along with the audience. I only have read the first issue (available here) of Wood's newer ongoing series, Northlanders, but on the strength of that issue and his work in DMZ I've decided to sign on for the collected versions. I'm looking forward to delving into this Viking adventure. Criminal: Ed Brubaker's best book, a comic noir about dirty deeds and people living on the wrong side of the law. Sean Phillips's art is top notch and fits the writing very well. If you like crime fiction, I can't recommend this highly enough. The Umbrella Academy: This series of mini-series by Gerard Way and Gabriel Ba has a lot going for it. The characters are interesting, the story exciting, and the art is outstanding. I have the feeling that they haven't hit their stride yet, however. There is so much going on here that can be (and, I think, will be) developed further that I think it will be some time before this comic is truly appreciated as one of the best super-hero books around. 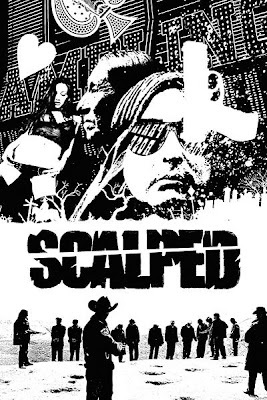 Scalped: Like the other titles in this section, I have heard nothing but praise for Jason Aaron's Vertigo crime series, set on an American Indian reservation. I read and enjoyed the first issue, available for free here. Of the four comics in this section that I am most interested in purchasing, this one probably needs my dollar the most, as it is less established and does not sell many copies in pamphlet form. It must be doing fairly well in collected form, however, as Vertigo still is publishing it. I plan on getting into this comic as soon as possible. Captain America: Another Ed Brubaker book, this time a super-hero espionage thriller starring everyone's favorite patriot (well, other than Tom Brady). I think the only reason I do not currently buy this one is that when I came back to comics, the comic had been ongoing for a while and I didn't want to jump into the story in the middle. I plan on going back at some point and reading the whole thing from beginning to end. Fables: This Bill Willingham Vertigo book places characters from fantasy into New York City. I have the first collected volume, but haven't gotten to it yet. Again, another book where I want to start at the beginning before getting myself up to speed, but it's looking kind of daunting right now. You can read the first issue for free here. Hellboy: I really liked Mike Mignola's first two mini-series, but have not gone out to get the rest . . . yet. So that's my pull list. Some day soon I'll post a list of the no-longer-ongoing comics that I'd like to purchase. Amazing Spider-Man numbers 555, 556, and 557 comprise a three-part story arc for the web-slinger. 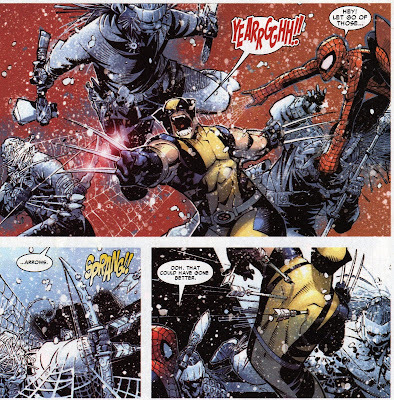 During a blizzard in New York City, Spider-Man and Wolverine save a mathematician from three warriors dressed in ancient Mayan armor. Spider-Man soon learns that the mathematician is the real threat: he used ancient Mayan algorithms to summon a Mayan deity so that he can bond with it and become a god-king, with some human sacrifices thrown in along the way. After battling the deity, Spider-Man stops the mathematician from sacrificing a female acquaintance to the deity at the correct time, thus preventing the mathematician from bonding with the deity. The deity returns to its own dimension. I typically do not read Spider-Man comics, but I purchased these because Chris Bachalo is the artist. He is one of the few comic book artists that can get me to buy a book that I otherwise would not buy. (John Romita Jr. and Adam Kubert probably are the only other artists in that category.) His style is unique, especially for super-hero comics. 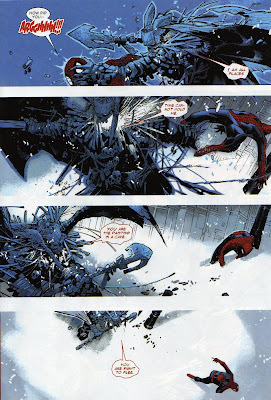 Bachalo's art also is the reason I chose to review this short run of Amazing Spider-Man. The story is nothing to get too excited about -- Spider-Man faces off against a new villain and defeats him -- although there are a few small moments throughout the three issues that develop Spidey's supporting cast and give him a chance to crack jokes. Writer Zeb Wells keeps the plot humming along and there are some solid action sequences. 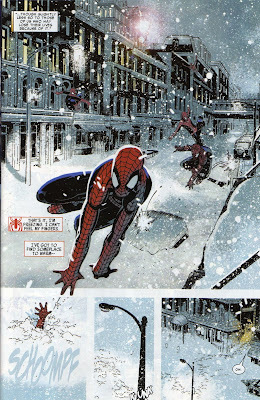 As you can see, Bachalo also does good work with Spider-Man himself, using a fairly simple, almost cartoony look that is quite dynamic and eye-catching. In the page above, Bachalo actually does a better job than most artists at laying out where the characters are and how the action flows from one panel to the next, but his Mayan deity is such a confusing mass of lines that it is hard to see that at first. Overall, I found these comics to be a fun diversion, but with little aftertaste (good or bad). 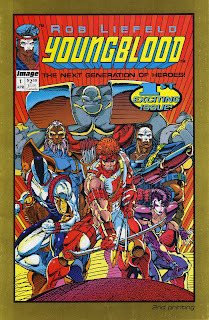 Welcome to my comic book blog, I Love Rob Liefeld.